The Wikipedia is a wonderful source of information which is frequently referenced in stories here. And, there are tools for tying Google Earth to Wikipedia like Placeopedia (which allows people to placemark good Wikipedia articles). 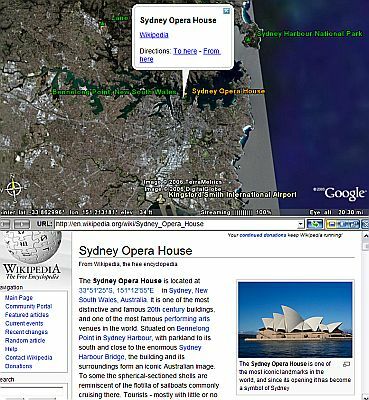 Recently, a Google Earth Community member called KASSPER, posted a very interesting Google Earth network link which allows you to see the "best described" 80 wikipedia stories in your current view. Apparently someone named Stefan Kuhn processed a database with about 34,000 wikipedia story locations and ranked them according to description file size. KASSPER then created a network link allowing you to view the locations as placemarks in Google Earth. There are more details about the process and how to participate in the project to georeference Wikipedia stories in his post. 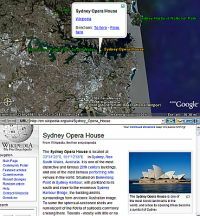 In the same GEC thread, KASSPER also posted a nifty web page tool for searching the Wikipedia database for locations. It dynamically generates place results based on what you type in the search window. This highlights the need for better search in Google Earth. GE's current search is pretty weak. Kind of weird when you consider it's from Google. For example, a search for "Richmond" produces one result in GE, but 20 results in the Wikipedia search above.